Final Fantasy XIV is built around a central story, full of heroic adventuring against terrifying opponents, but with a side-order of political intrigue and an undercurrent of mysticism thrown in. There are a lot of moving parts, and watching it all unfold is breathtakingly satisfying. That story – known as the Main Scenario – is set in a late-medieval to early-industrial period, with shades of steampunk and technomancy. A tenuous peace holds between three central nations, each struggling to deal with internal conflicts and the constant threat of war from abroad. In these difficult times, a hero is sought – a Warrior of Light. Guess what: that’s now your job. Alongside that Main Scenario quest chain are side-stories for each class and profession. As I levelled up as an Archer then Bard, my trainers would send me out on missions to further the aims of the guild. Some would be more martial, while others would have a philosophical tangent. 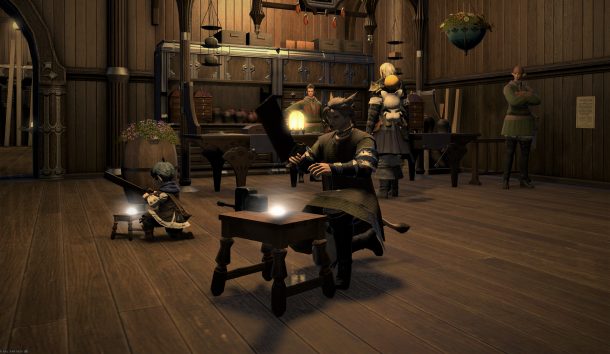 It also helped to explain the purpose of each guild in the world – the Archers were seen as defenders of New Gridania, while the Arcanists would also serve as customs auditors for the port city of Limsa Lominsa. Getting to the original level cap of 50 was astoundingly easy. The server I chose had a permanent ‘Road to 60’ XP buff running, and I had a bunch of XP-boosting gear to get me started. Just by focusing on the Main Scenario and Guild quest content, I managed to reach what I thought was endgame quickly enough. However, the ‘Vanilla’ Main Scenario content can be carved into two chunks. 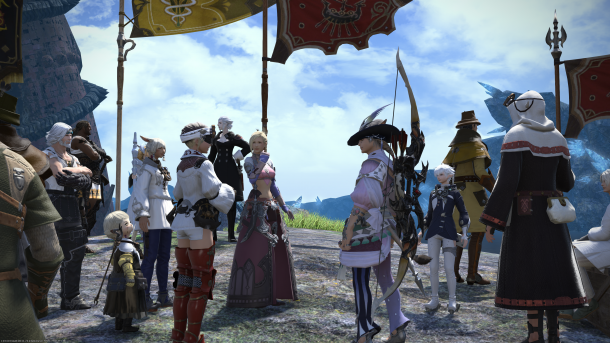 The 7th Umbral Era quests launched with the base game, while the 7th Astral Era quests were added in through patches over the course of two years. Like a child forced to eat his greens, I had to chew through this second batch of quests before I’d be allowed into the Heavensward expansion content, and it became a slog of jumping around Eorzea just to inch the plot along. 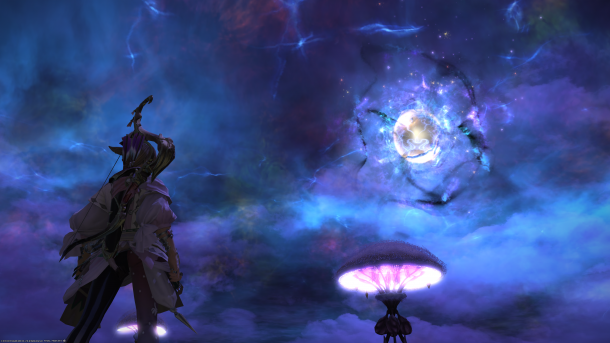 I can see how this would have been nicely spaced out at launch but, as an FFXIV latecomer, it gets a little painful. Speaking of mandatory content, that Main Scenario also forced me into grouping up for dungeons (multiple boss instances) and trials (boss-in-a-box). I can understand the rationale behind using instances to tell parts of the story, but I prefer to look for groups on my terms, and not because the plot demands it. I also have a few gripes about how the story is told. There’s the voice acting that grates on me from time to time, and the clunky pseudo-medieval English that feels like Shakespeare-done-badly. Often, dialogue will feel a little clunky and a little expressionless as if actors are battling with the script. And yes, Aught is Always Amiss. Even so, the payoff for completing it all is immense, with multiple cutscenes to pull the pre-expansion story threads together, and creating a monumental cliff-hanger for the Heavansward expansion. Overall, it’s better than anything I’ve experienced in World of Warcraft, and ranks alongside the original launch of Star Wars: The Old Republic (although this has diminished in recent times). Yes, it’s been a hard slog sometimes, but it definitely feels worthwhile at this point. I have a pizza analogy for describing MMOs. Some are thin-and-crispy, covered in a multitude of tasty but superficial toppings. Then there’s deep-pan, with fewer game systems that are intricate and detailed, where you can get lost in a diversion for weeks. 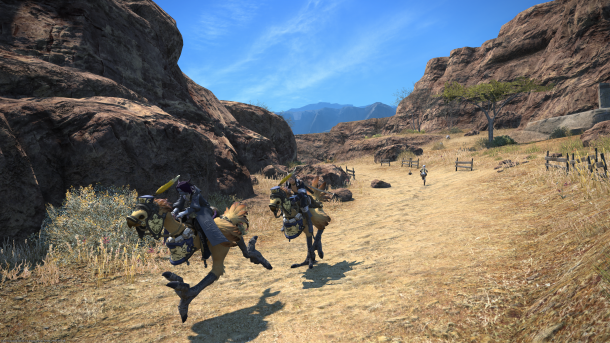 Final Fantasy XIV easily falls into that second group, with some unique approaches that offer a meaningful alternative to the daily grind. I even appreciate that the whole banking and marketplace management is taken care of through Retainers – hired NPCs that do the busywork for you. It’s a neat twist that challenges MMO preconceptions, adding a touch of distinctive style. Looted weapons and armour are stored in an Armoury Chest that’s separate to the main inventory, and the slot-specific compartments make it easy to manage chest pieces separately to hats. I’m terrible at managing my own inventory, and this small touch is a huge perk. There’s even a ‘Recommended Gear’ option that will equip my character with the best selection from what I have depending on what I’m doing, and gear lists to make swapping things around easy. For me, though, the best bit is the crafting and gathering system. I can pick any profession I like, or even learn all of them. Each profession has its own levelling progression, and each tends to complement the others. There doesn’t seem to be any competition for gathering nodes, but each spot can offer up different types of resource – and even a chance at some high-quality stuff. Crafting involves careful use of skills to make items, and again has a chance at producing high-quality gear. And yes, I’ve been collecting a fresh set of clothing and tools to help improve both of these. And the great thing is that, even as an FFXIV latecomer, there’s a market for all this stuff! I don’t know if it’s because I’m playing on a new-ish server, or because there’s been a surge in new players, but the marketplace has been doing a brisk trade on both materials and finished items. I only tend to dabble in the economy, but this is great news. Long-time readers will know that I’ve historically been a big fan of spellcasters. Whether it’s throwing fireballs or arcane missiles, I’m a sucker for standing back and hitting those big DPS numbers. More recently, though, I’ve shifted away. Being stuck to a spot when casting felt painful, and there was a trend by designers to go heavy on the glass fragility while leaving out the fun damage cannon. Self-healing melee and pet classes started to win me over, alongside more dynamic combat. As it turns out, FFXIV offered me a mix of both. Archer (and Bard) lets me shoot arrows while casing, and has a ‘Second Wind’ heal to help me get out of tight spots. 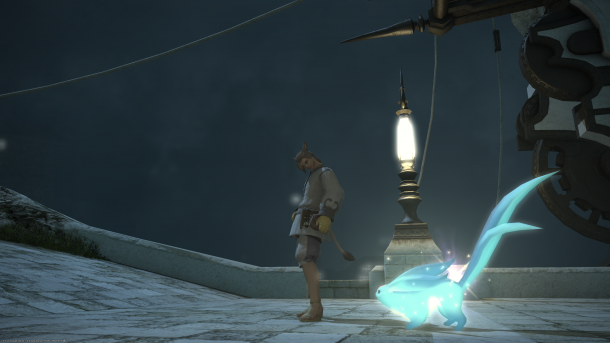 Carbuncle herding has a much longer (and stationary) cast time, but you get a pet and some heals as a compromise. Melee I’ve yet to try, but there’s a range of options from Gladiator to lancing Dragoon and quick-moving Ninja. Sometimes, the combat can feel a little clunky, particularly when there’s a lot of damage hitting the floor. FFXIV has adopted the trend of telegraphs for many boss attacks, but it’s only an indicator of where the damage will land, not when. As a result, there’s a bit of skill in watching boss castbars or animation tells in order to pick the best time to move. And, while there’s the Main Scenario story for my main class, each quest hub is liberally dusted with NPCs eager to offer me work. Dynamic content FATEs offer a quick way of picking up XP just by wandering around the map and completing kill or patrol missions, and each unlocked dungeon has an LFG queue that moves briskly. However I slice it, I’m definitely not bored for lack of content. 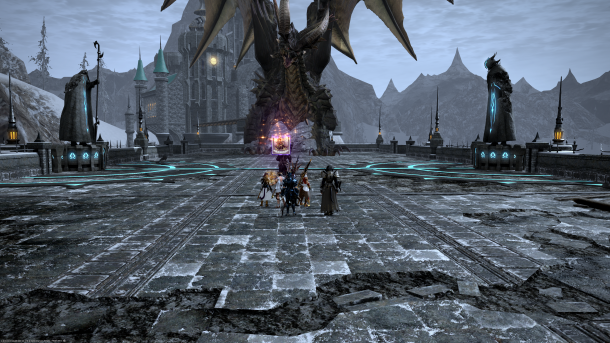 Sometimes being an FFXIV latecomer has its benefits. I originally went into Final Fantasy XIV: A Realm Reborn on a 3-month subscription, giving Square Enix 90 days to win me over. 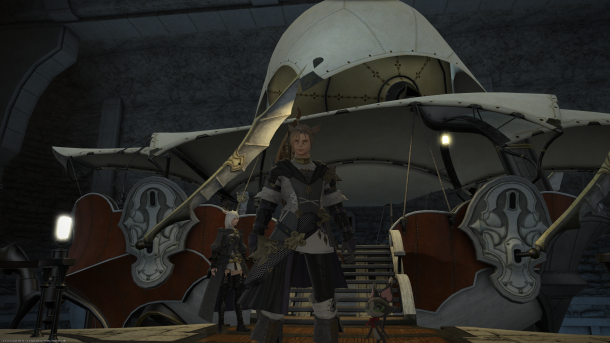 It’s taken me a third of that to complete the base game and take a few steps into Heavensward, the first expansion. Over the remaining two months, I’ve got that content to chew through and there’s the more recent Stormblood expansion on top. In terms of value, the base game costs £10 including 30 days of subscription time, and I’d argue that it’s money well spent. Beyond that you’re paying around £9 a month, plus the usual savings for 3 and 6 month deals. Square Enix also offer a bundle that includes both expansions for £35, which might make more sense if you’re diving in for the long haul. Although everyone I’ve spoken to says that the story gets better in the expansions, I can’t testify about it myself. There is a free trial that works for every class up to level 35, and refer-a-friend bundles that can make getting started a ton easier if you know someone playing. I’d strongly recommend this, but more for the Aetherlyte tokens that make getting around the world much cheaper. It also means that there’s the opportunity to find levelling buddies that can play alongside you and help shorten those dungeon queues. That said, there’s also a few wrinkles in SE’s pricing approach that annoy me. A copy of the game allows you to create characters on EU, US and Asian servers, but you’re locked to buying gametime from the same region you buy the base game in. And, while Final Fantasy XIV is available on PC, PS4 and Mac, you need a copy of the base game plus expansions for each platform you want to play on. Both of these feel like unnecessary complications that work against the average gamer. If you’re going to join as an FFXIV latecomer, I’d suggest taking the following steps to make sure it’s the right game for you. Ideally, find someone who plays and get a refer-a-friend invite for the sweet bonus items. Play a little and experiment with a few classes, and buy the full game if it works for you. At the moment, I’d suggest the Complete bundle as it’s good value and unlocks more class options, but the base game for £10 is hard to argue against. This entry was posted on Sunday, February 4th, 2018 at 5:13 pm	and is filed under Final Fantasy XIV, MMO Musings. You can follow any responses to this entry through the RSS 2.0 feed. Both comments and pings are currently closed. FFXIV is clearly “covered in a multitude of tasty but superficial toppings”… some “RPG mechanics” are only here to make it look like a rpg (we get levels, hp, mp, equipments, numbers everywhere, but they have no real meaning. Levels and equipments could be removed and stats normalized and we wouldn’t lost anything – it’s exactly what they did to PvP, actually – except we would waste less time with the stupid grind, which means less money for SE on the long run), job system was added only to make it look like a FF (but it’s nowhere like FF5 or FF11 jobs system…), triple triad and chocobo races were added also “because FF” and have been left to rot, etc. etc. This also is just appearance, superficial. Retainers don’t do anything ; they’re just a bunch of polygons displayed when you sell item on the market through a similar menu as any other MMO with an auction house. And a lot of other things, like the lamentable quests, plot, FATE, cut-scenes, etc. FFXIV is just a nice chat room, really. Have you even played the game? ._. – “RPG mechanics” are only here to make it look like a rpg. Then what is it if it’s not a MMORPG? level in PvP to make sure skill, not gear, is the reason you win or lose. are seasonal or you have long-term focused dailies in WoW? – triple triad and chocobo races were added also “because FF” and have been left to rot, etc. etc. – Retainers don’t do anything ; they’re just a bunch of polygons displayed when you sell item on the market through a similar menu as any other MMO with an auction house. – And a lot of other things, like the lamentable quests, plot, FATE, cut-scenes, etc. and I can think of many memorable cut-scenes. -Even just the last update, the only thing to build hype was the presence of Kekfa. housing system and many things more you can check in the patch notes. which are not related to previous games. It’s totally normal you don’t like the game, but please, don’t lie. Other people might enjoy stuff you don’t and it’s perfectly normal too. 1 month.. wah.. have been playing since the day of release, and only got 1 character to start of Heavensward so far. Feel so slow reading this lol. My biggest gripe, as someone who moves, yes the region lock is very annoying. You’ve been playing since 2013 and have only just made it into Heavensward? That’s 1396 days (from launch>stormblood), ignoring leap years. That’s less than 1hr/wk. I hit HW off a fresh toon after just over 48hrs of playtime (and I wasn’t even rushing through). I just started playing FFXIV this past weekend at the suggestion of and invite from a close friend. I absolutely love what I have been able to experience so far, and your well-worded review gives me heart that I can look forward to much more fun and excitement to come! I have been a huge fan of MMORPG’s over the years, delving deep into some (WoW, naturally, but also GW, WildStar, and SWTOR) while dabbling in others (GW2, TERA, Rifts, and probably a few I am forgetting). WoW has been the one that has outlasted them all, but at the same time I have desperately needed something new (well… new to me, at least!) and different. They are both really lovely, immersive games, but in different ways, each with their own aesthetics, lore, mechanics, and communities. It is nice to have some variety back in my MMORPG diet! Also, it gives me a warm sense of nostalgia, as the experience hearkens back to some of the MMORPGs I played when living in Aomori. Unfortunately, many of those were pretty but disposable, and lacked the interface polish, narrative depth, and product longevity of FF. 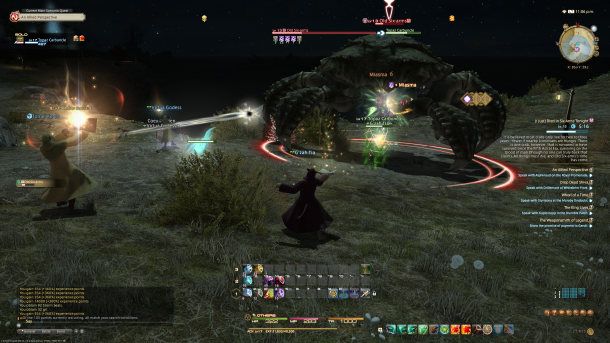 Honestly, anyone who hasn’t played FFXIV yet and still has an MMORPG itch to scratch… well, I couldn’t think of a better feast of food for thought than your review!